In 2006 Eamon Sweeney was awarded the first musicology PhD to be accredited by DIT Conservatory of Music and Drama. His doctoral thesis, The Guitar and its role as an accompanying instrument in seventeenth – and early eighteenth-century France, investigated the five-course guitar’s role as a continuo instrument in the court of Louis XIV, a hitherto unexplored area of French baroque music and early guitar performance practice. 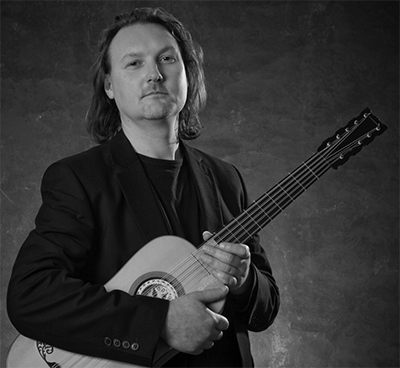 Eamon has lectured and given seminars on Baroque guitar performance at Dublin, Dundee and Bath International Guitar Festivals as well as for DIT and UCD.In 1999 Eamon received his BMus (1st Class) in Guitar Performance from Trinity College, Dublin and DIT Conservatory of Music and Drama and has since performed on stage, radio and television, both as a solo artist and with various ensembles including the National Symphony Orchestra, National Concert Orchestra and Opera Theatre Company. Eamon teaches music with Co. Wicklow VEC.